Hi foodies...Welcome to AYESHA'S KITCHEN. Roasted beetroot salad is a salad packed with nutrients and powerful anti oxidants. Beets are very low in fat and of exceptional nutritional value. Beetroot roasted served with cucumber and green leafy vegetables is a best accompaniment with chicken. Roasting makes beets something crunchy into silky and tender. Add olive oil and salt to beets and you can toss it in oven until tender or you can do it on stove top for 5 - 8 minutes in a low flame. Now mix the roasted beet with pepper powder, vinegar and then add chopped cucumber, red apples. 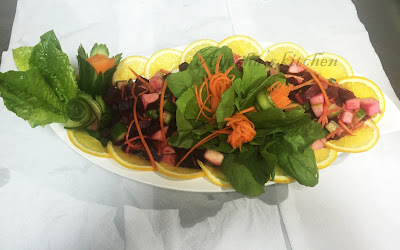 Garnish with lettuce, carrot slices, orange slices or some green veggies that make more colorful.